The K2 Program was written & designed by Doug Montanari, to challenge the scouts consistancy in practicing knife safety & in using the 6 basic knots. The scouts first earn the Whittling Chip as Bear Scouts and then practice and master the six basic knots. The six basic knots are the square, sheetbend, dbl half hitch, tautline hitch, bowline, clove hitch. Once a scout has mastered all 6 knots, allowing each knot to be tied correctly with in a minute for each & giving a practical use for each knot; they are tested twice, by a Webelos Leader & then the Cubmaster. 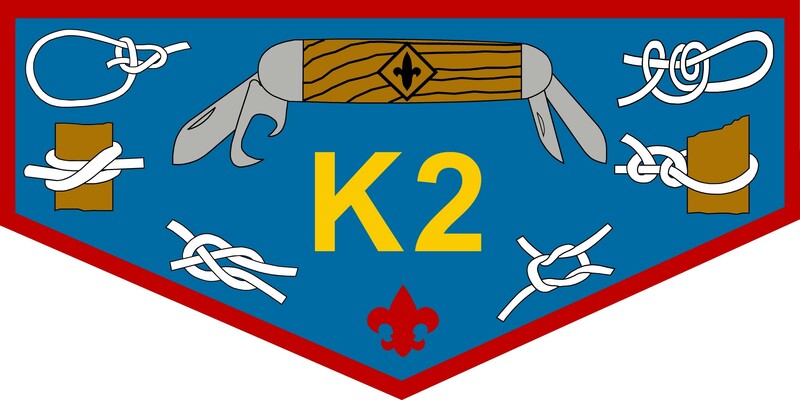 Upon completion they are awarded K2 Patch at the next Pack Meeting. At the Pack Meeting, they are reminded that there is a commitment to this program. The boys that earn the patch agree to be instructors to other scouts. Once earned, it is a requirement that the scout be tested each year that follows, as part of there commitment to the program. During the developement of this program it occured to Doug Montanari that in order to make this program a success, Leaders would need to know there knots too and the Pack allowed its Leaders to earn the Patch as well. Later, some Boy Scouts wanted to earn and wear the patch. However, with Boy Scouts, this would be a conflict with the Order of the Arrow Lodge Flap. We restrict the patch to those Boy Souts that are active Den Cheifs with our Pack, with the understanding the patch cannot be worn as a Boy Scout.